While starting a business is a tough proposition, continuing it for years can be equally challenging. A lot of effort is put in to get the business up and running. Post this stage, the first few years are required to reach the break-even. Thereafter reaching the break-even point, the company is expected to make profits. So, a lot of calculation goes into that. However small or large a business be, entrepreneurs have a vision whereby they plan the growth strategy of the business. So, if you are planning to own a business, and then make sure you make a proper business strategy from beforehand. 1. Expand the range of products– Increasing the product range can help in growing the business. Many a times, working on the product line serves the purpose of increasing sales and earning profits. 2. Add value– Customers will find out what value your product or service is providing them. If it helps them in some way, they will certainly come to you. Identify that part and use it further to convince your potential customers. 3. Expand the market– Market expansion means selling the products in a new market. This is crucial for increasing your sales and profits, thus alleviating the growth process. 4. Know your competitors– Doing business does not mean you will stick to your business only. Widen your outlook and search how your competitors are growing! That does not mean you would be too much interfering! Be open to new ideas and implement them for a growing business. 5. Penetrate market– The aim of market penetration is to enter the market smoothly with a product and capturing a substantial market share. It does not necessarily change the overall marketing strategy but pushes the revenue generation further. 6. Identify your target customers– It’s a fact that your products and services cannot serve everybody. So knowing the customers you are serving becomes a plausible factor. Know your target customers and try to fulfil their requirements in totality. 7. Acquiring a company– Acquisition means when a company buys out other small companies. This helps in reducing competition, expanding the customer base and the market share as well. 8. Consider the change and effect– Take the social, economic and political factors in consideration that might affect your business directly or indirectly. Plan accordingly and take a witty decision to face the consequences. 9. Diversifying the products– Diversification pertains to the fact that a particular company is aiming to sell new products in a new market. But before launching this, a proper market survey is required to ensure there would be potential customers for the new product. 10. Identify various channels of revenue– Try to broaden your sources of revenue from the existing one to make it more profitable. Think about the various streams, the revenue can be generated from. 11. Focus on strength– From childhood we are taught to overcome our weaknesses. But that doesn’t work all the time. Sometimes you need to spend your energy only on strengthening your strength further rather than spending it on overcoming your weakness. 12. Reward the talented– Pay your talented, dedicated and hard-working employees well. One who completely understands the value proposition of your company and works hard as if it were his own. You offer them great package and in turn they would help you increase your customer base. 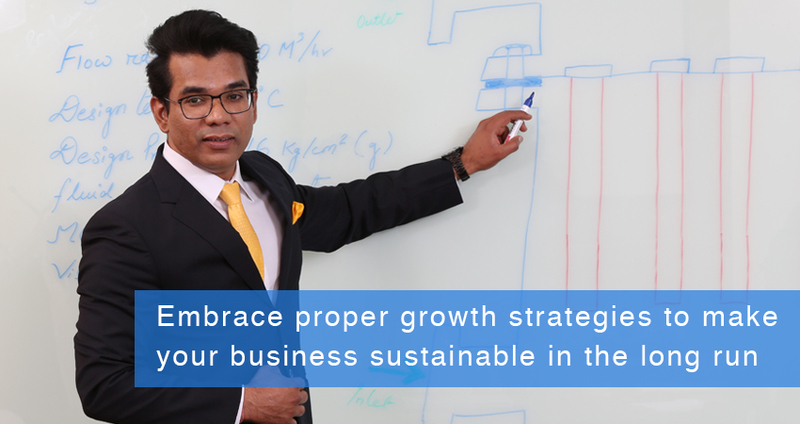 Adopt these growth strategies in your business and witness it to flourish and bloom in no time. But whatever you do, plan to implement them properly after doing research works and market surveys to reap the maximum benefit out of it.